The Humber RWG identified Flood Protection & Assimilation and Ecological Function & Biodiversity as being of high importance in terms of high level function provision within the estuary. However, Transport & Accessibility and Recreation and Social Use were scored only at a moderate importance level. Figure 22: Humber uses/issues importance weighting. This RWG scoring rated overall provision of these four main topic areas at below the mean for the TIDE estuaries, together with Transport & Accessibility, but with Flood Protection & Assimilation and Ecological Function & Biodiversity rated as more important than the mean. 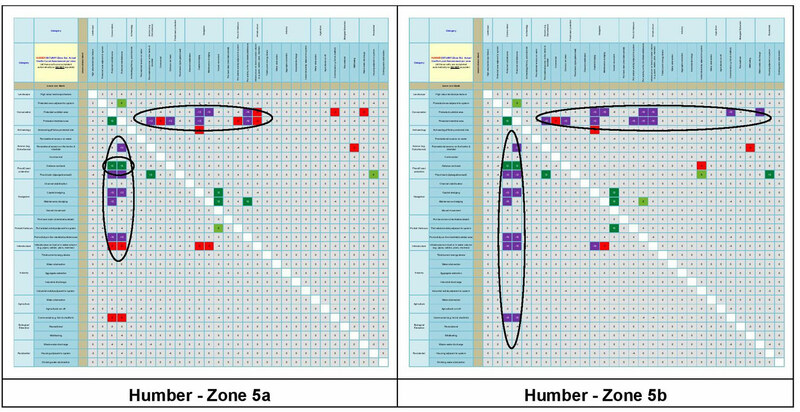 For the conflict analysis, the Humber system was divided into 5 main zones using existing established management boundaries (Figure 23). The outer estuary was however split into sub-zones, as the land use on either bank is considerably different in this area. The entire estuary and the lower reaches of the freshwater system (Zone 1) are included within the Natura 2000 designation (SPA & SAC). Zone 1, which covers the tidal freshwater/upper oligohaline reaches of the system, includes the two main fluvial tributaries into the estuarine system. These tributaries feature fringing dykes with very little intertidal mud or marsh habitat available. Commercial navigation occurs along both of the tributaries to inland ports and wharves, but with the fairways of these fluvial systems not subject to any maintenance dredging. Zone 2 includes the inner estuary oligohaline/mesohaline section. As with Zone 1, this zone features a largely agricultural hinterland and is used as a navigation. However, this zone is characterised by several extensive and mobile sandbanks and vegetated islands. Zone 3 in the inner middle estuary mesohaline zone includes the City of Hull frontage and port complex. As with the rest of the estuary, the intertidal and subtidal areas are covered by the Natura 2000 designation and again, several extensive mobile sandbanks are present mid channel. As with the inner estuary, no active maintenance dredging of the main navigation channel is undertaken, and instead, an active system of sounding and navigation marker repositioning is employed. However, the entrance to docks and berthing pockets are actively dredged. Zone 4 covers the outer middle mesohaline/polyhaline zone. This area includes the extensive ports frontage on the south bank, with associated industrial development on the near-hinterland and gain dredging of harbours and pockets is undertaken. Historically, the morphology of the estuary in this zone has been modified through landclaim for agriculture. Zones 5a and 5b cover the outer polyhaline zone and feature a much wider estuarine morphology, which include the extensive mudflats of Spurn Bight (included in the Natura 2000) and the sand spit of Spurn Peninsula. Coastal recreation occurs on the outer south bank, with the port of Grimsby also in this zone. The only large active fairway dredging programme (Sunk Dredged Channel) is also located in this zone (5a). 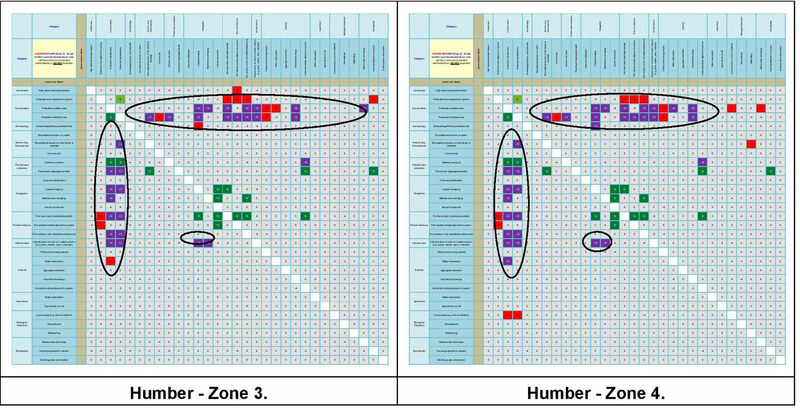 Strong negative and positive associations for the Humber are provided in Tables 7 and 8 respectively. Figure 23: Humber - high scoring user interactions per zone. Table 7: Strong negative associations between uses/users for the Humber Estuary. Table 8: Strong positive associations between uses/users for the Humber Estuary. The main tidal freshwater tributaries of the Humber (Rivers Ouse and Trent) are included in Zone 1 (Figure 24a) of the conflict analysis. These tidal rivers flow through predominantly low-lying agricultural land and are dyked/banked for the majority of their length. The lower reaches are included in the Natura 2000 designation although there is very little intertidal mudflat and marsh present. The river systems are used for navigation (e.g. by vessels up to c. 4,500 DWT to the Port of Goole), but the river channels are not actively dredged. Few high scoring conflict interactions were identified, e.g. from flood protection requirements and access on conservation protection. Figure 24a: Main conflict scores for the Humber Estuary. The Zone 2 area (Figure 24a) which covers the upper estuary to the confluence of the twin main tributaries is also located in predominantly low lying agricultural land which is protected by embankments. The reach is included in the Natura 2000 designation and navigation through the reach is achieved by adaptive channel buoyage in reaction to channel movement. The zone features an increased number and severity of interactions, although they remain low in the context of other zones in the estuary, with key impacts resulting from flood protection requirements, recreational access, ports activity and infrastructure on conservation protection needs, and from conservation protection requirements on recreational access and flood defence setback, as well as to a lesser extent, navigation and ports requirements as well as infrastructure needs. 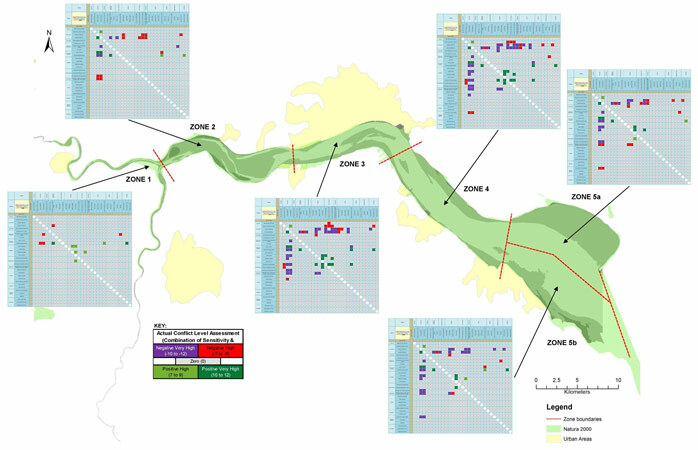 Zone 3 (Figure 24b) which covers the middle estuary (inner), including the City of Hull frontage and ports complex, features a considerably elevated conflict interaction level (frequency and severity). There is a clear concentration of issues relating to the provision of conservation protection, either by a range of activities on conservation protection, or by conservation protection on other activities. Whilst the majority of these interactions were with coastal protection and ports related/navigation uses, other high scoring interactions were recorded, e.g. conservation protection impacting on waste water discharge, seabed infrastructure on navigation needs. Figure 24b: Main conflict scores for the Humber Estuary. Zone 4 (Figure 24b), in the outer middle estuary includes the main port frontage of North Killingholme/Immingham on the south bank as well as agricultural land on the north, this land claimed from the estuary in the 18th & 19th Century with considerable modification to the morphology of the estuary in this area. The hinterland of the zone remains low-lying and thus protected by dykes/banks, with issues relating to flood protection maintenance along some of the reach. Severe conflict interactions are broadly similar to those of Zone 3, relating to impacts to conservation protection from flood protection, navigation and ports related activities and vice versa. Again, impacts of estuary bed infrastructure on navigation were identified as a problem and in this zone the requirements for flood defence setback on industrial activity in the hinterland were also scored as a high conflict. Zones 5a and 5b (Figure 24c) are located in the outer estuary covering the north and south sides respectively. The north side features extensive intertidal areas fronting agricultural land, with the south side including the port of Grimsby and recreational resort of Cleethorpes. Zone 5a includes the only area of maintenance dredged fairway on the estuary (Sunk Dredge Channel), with the intertidal and subtidal areas included in the Natura 2000 designation. Unsurprisingly therefore, a series of conflict interactions between navigation and ports needs and those of conservation protection (and vice versa) are identified as severe although importantly, they are somewhat reduced from those recorded in Zones 3 and 4. However, the high scoring conflict interactions between flood protection needs and conservation protection remain comparable to Zone 4. As with some of the upstream zones, an important synergistic interaction was identified between flood defence setback requirements and conservation protection. Figure 24c: Main conflict scores for the Humber Estuary. Zone 5b which includes the port of Grimsby as well as the recreational resort of Cleethorpes and the Tetney Monobuoy bulk oil transfer facility featured an increased number of severe conflict interactions, although in general, these were less numerous than in Zones 3 and 4. For the most part, interactions were again related to flood protection provision and navigation and port related activity on conservation protection needs (and vice versa). A high scoring impact was observed from commercial fishing on conservation protection, as well as infrastructure on the bed on navigation and conservation protection on commercial shell fishing and residential waste water discharge. Synergisms were again observed from flood protection setback on conservation protection, as well as flood protection banks on recreational access and adjacent housing provision. The conflict matrix outputs for the Humber indicate that there are a number of high scoring potential conflicts, many of which are either acting from or on conservation protection requirements. Many of these interactions are with navigation needs and associated ports industry, although also in relation to flood protection requirements. Interestingly, whilst the abundance and severity of these interactions is possibly greatest in the middle estuary (Zones 3 and 4), reducing somewhat in the outer estuary (Zone 5a in particular), although Zone 5a includes the only area of fairway subject to maintenance dredging. This may be due to the presence of a dredge management strategy for the estuary, recently produced and implemented to meet requirements under the Habitats Regulations. Whilst there are conflict interactions relating to navigational and conservation protection needs, more consistent interactions occur between conservation protection, ports activity and flood protection in the middle and outer estuary, this reflecting the limited resources available particularly in relation to intertidal habitat and compensatory provision. Upstream in the inner estuary and tidal freshwater tributaries, the level of user conflicts reduces both in terms of frequency and severity. The presence of flood protection banks and access along them are identified as a high impact on conservation protection, and with conservation protection impacting on public access and the provision of set-back for flood protection. Synergisms are however identified from flood protection set-back for conservation protection as on recreational access and the dislocation of a reciprocal synergism and associated management issues will be discussed later in text. Navigation related conflicts, in particular with conservation protection needs are relatively low to absent in the inner estuary and tidal freshwater tributaries. These zones include navigational access through them by vessels up to c. 4500 DWT (e.g. up to the Port of Goole. However, access to Goole and other inland docks is maintained in the estuary through an active adaptive buoyage strategy, with channel depth and position regularly monitored and the path of the navigation channel changed through buoy relocation as necessary. Maintenance dredging is not undertaken in the lower reaches of the freshwater zone (e.g. to the Port of Goole), the channel maintained through flow and in some areas, repositioning of buoyage. This effectively limits the draught of vessels moving through the system. Section 8 (Appendices) provides the Conflict Level Assessment spreadsheets for Zones 1 to 5b of the Humber in greater detail (larger scale).